Located on what is voted the best beach in Hawaii, Kailua Beach! Just minutes from Honolulu yet a World away. That can be rented as a 2 or 3 Bedroom. Pilipu pl a Registered Historical landmark! Do you want the best lodging and accommodation in Hawaii? We have private beachfront or beachside homes at the best beach in Hawaii, Kailua Beach on Oahu. On your next vacation to Oahu in Hawaii do not stay in a hotel, condominium (condo), or a bed and breakfast. 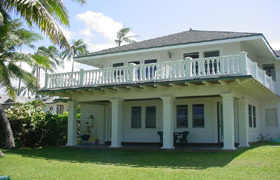 Stay in one of our vacation rental homes in Kailua on Oahu next to Lanikai Beach. Kailua is the best kept secret in Hawaii. (so, don’t tell everybody about it, just your friends) There are no hotels here so few tourists or tour agents know about Kailua or the Oahu vacation rentals there. It is an upscale residential community. The beach in Kailua was voted the best beach in Hawaii. Kailua is 20 minutes from Honolulu and Waikiki Beach yet a world away. Those of us that have discovered it know it’s the best place to live. Waikiki is not really Hawaii it’s a tourist trap, stay in a vacation rental home in Kailua on Oahu, live with the people of Hawaii and enjoy the aloha, peace and tranquility that Hawaii has to offer.